I’ve been doing homework in Catalan. 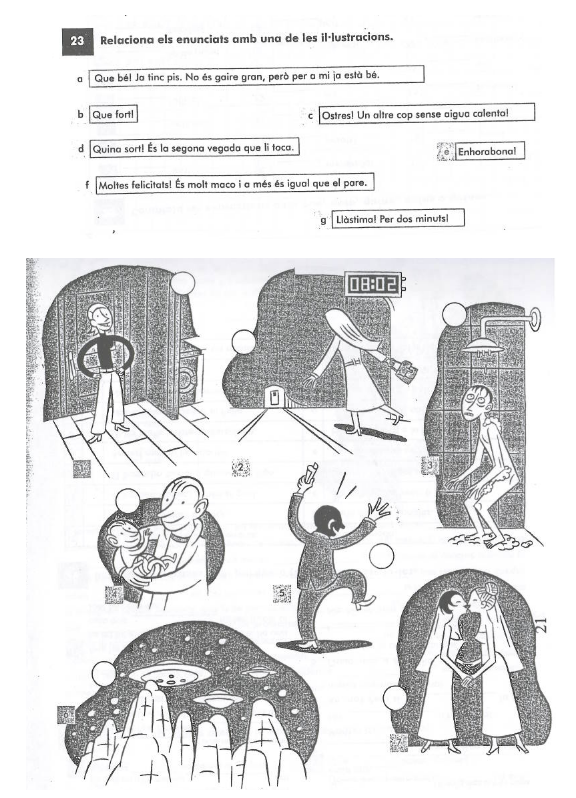 The exercise is very simple: match between the sentences and the pictures. a. Good! Now I have an apartment. It is not very big, but for me it is good now. c. Damn! No hot water again! d. What a success! It’s the second time that I win (the lottery). f. Congratulations! He’s very beautiful and looks like the father. g. Such a shame! Just two minutes! This must be one of the cutest and most touching things i have ever seen. I thought about writing a philosophical social commentary on it, but i won’t. Ús raonable. Dibuix de “Veus – Curs de català – Llibre d’exercisis i gramàtica”. Autors: Marta Mas Parts i Albert Villagrosa Grandia. Il·lustraciò: Linhart i Javier Olivares. Publicacions de l’Abadia de Montserrat, juny de 2007. Poland is paralyzed by unprecedented riots over … legalization of abortion … or trade unions … or something. The news on all TV stations show people blocking streets and impossibly huge traffic jams. A particularly dramatic shot showed a semitrailer getting out of the jam and desperately falling from a mountainous highway to the sea. The truck drowned, of course, but the driver got out somehow, and in an interview he said that he fully supports the protesters. The great part about all of this is that since it came to me in a dream, i can perform this song as my own.